On January 14, 2014 a new update to the Java runtime was released (1.7.0_51). This release includes a major change in the way Java handles self-signed Java applications like Praisenter. NOTE: This only affects users running the Webstart download. 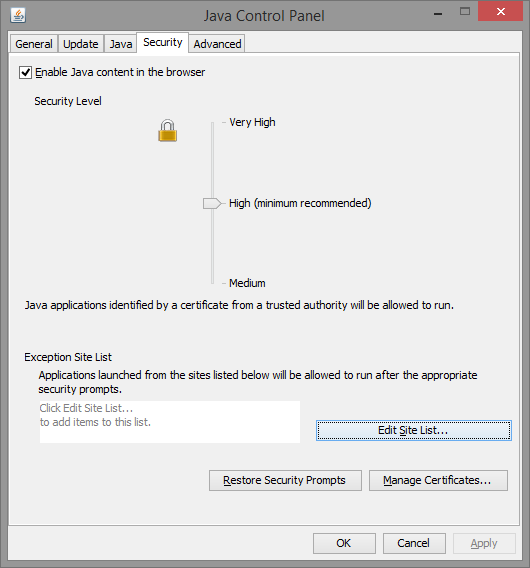 Lower your security settings in the Java Control Panel. 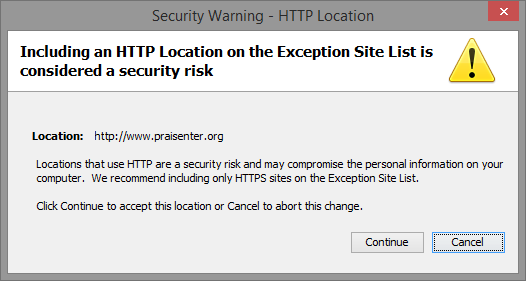 Add http://www.praisenter.org to the Exception Site List. We recommend that you go with option 2 for the best security. This will allow Praisenter to run but will continue to block other self-signed Java applications. Click “Continue” then click “Ok” until all the Java Control Panel windows are closed. You should be able to run Praisenter now. At this point you might be wondering, “Why isn’t Praisenter signed properly” or something to that effect. Well, up until this update it really hasn’t been an issue. The only problem was users seeing a nasty warning message. Now, as you can see, things have changed and we need to re-evaluate this decision. The major factor in getting Praisenter signed properly is cost, as you might imagine. Until a decision is made, the above steps will be necessary. There are NO worship presentation programmes on Chromebook apps. Also the Powerpoint equivalent doesn’t play audio. There are NO slide presentation programmes on Chromebook apps that play audio. This seems like a great opportunity to get seen on this rapidly expanding OS – it is bound to take a large part of the Windows market. It would be brilliant if someone could get Praisenter onto Chromebook apps.